For those new to our world, and also to share with the readers seeing this text in the Chinese edition, we will aim here to summarize the most important criteria which are used by contemporary “Western-style” museums and private collectors in judging the quality and desirability of crystallized mineral specimens. 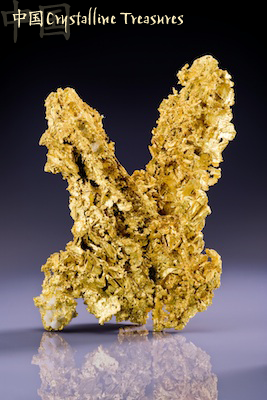 Experienced collectors who have spent many years viewing mineral specimens in museum and private collections, and on the open market, all agree broadly about the major criteria for the judgment of “quality” in mineral specimens. That is, a set of standards exists which are more general and universal than those which derive from the personal priorities and specialties of individual collectors, and these standards are broadly applied to all mineral specimens when viewed “in Western eyes.” Typically, a collector who looks at a specimen applies the criteria to it quickly, all at once, and perhaps only half-consciously—the criteria are all elements of a unified response in the collector’s mind. A clear understanding of these criteria, if applied to Chinese specimens by Chinese miners, museums, and collectors, is key to helping them share in Western-style appreciation (and marketing) of these natural works of art. “Old classic” specimens from famous localities which have not produced such specimens for many years or decades, or for one or two centuries, are favorites with many Western collectors. These classics are most highly prized when they are accompanied by old collection labels and/or other forms of documentation which prove their age and hint at their history as collectors’ items. Mineral specimens like these are cherished as witnesses to some of the early history of mineralogy, mining and mineral collecting, and they bring much higher prices in Western markets than contemporary specimens of the same mineral species from a new location (such as a recently opened mine in China), even when the overall quality is the same for the old and the new specimens. Older Chinese specimens, collected before 1990, have now acquired some of this same kind of value and desirability, since so few specimens were preserved from Chinese mines until the 1990s. In fact, the earliest labels we have seen on specimens for sale in the West date from a famous exhibition in 1980, when the Geological Museum of Beijing exhibited for the first time at the Tucson Gem and Mineral Show and exchanged the pieces they showed for American classics to take home. They traded one of their azurite specimens for a significant cabinet-size gold specimen at the time. For Westerners, the size, beauty, shape, and perfection of mineral crystals are all-important. Of these, the size of the crystals is the most obvious characteristic, and it is roughly true that the greater the maximum size of the crystals in a specimen the more desirable the specimen is. However, there are few absolutes: one must know the size of the largest known crystals of a species in order to judge how remarkable a given specimen is in comparison. The more nearly perfect the form of a crystal, the more desirable it is to the Western collector. Here again, basic knowledge is crucial. In fact, only a basic knowledge of crystallography will allow a collector to know what the ideal shape of a crystal of a particular species is. In all cases, of course, the sharper the edges of the crystal, and the smoother its faces naturally are (without polishing! ), the better the specimen is judged to be. Western collectors tend to put a premium on sharply presented single crystals of any form, and on crystals which display unusual features. For instance, crystals which display faces or crystal forms which are rare for the species, or obvious twinning, are highly valued. 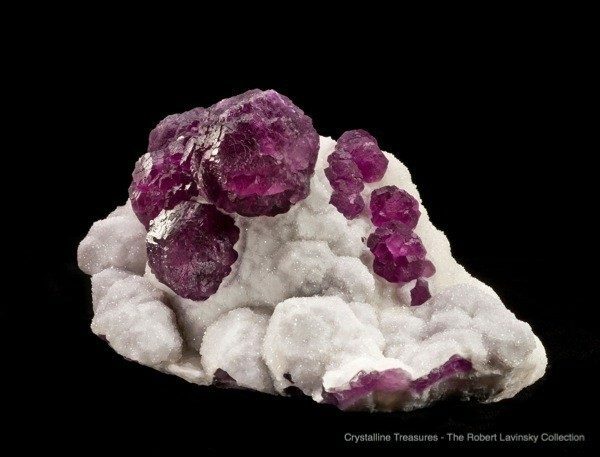 In general, bright red, orange, yellow, green, blue and purple minerals are more desirable—when well-crystallized—than brown, black, gray or white minerals. When species which are usually white or colorless appear in crystals which trace elements or mechanical inclusions have tinted in bright, attractive colors, the specimens acquire considerable added value. When crystals of a black, white or colorless mineral are accompanied by crystals of other, more colorful minerals, a similar value-added effect occurs. Fluorite on drusy quartz, 24.5 cm, from the De’an mine, Jiangxi Province, China. This is an excellent specimen because it has (l) good crystal size, (2) well-formed crystals, (3) a focal-point crystal larger than the others, (4) bright, clean color, (5) attractive color contrast between fluorite and quartz, (6) good transparency/translucency of crystals, (7) aesthetic sculptural shape overall and (8) freedom from damage. The only shortcoming is the luster of the faces, which are somewhat rough rather than mirror-bright (although typical for this location). Most non-metallic minerals are capable of forming crystals which are translucent, at least on their thin edges, and a smaller number of minerals can form crystals which are completely transparent. In general, the greater the degree of transparency or translucency which a crystal shows, the more highly prized it is. 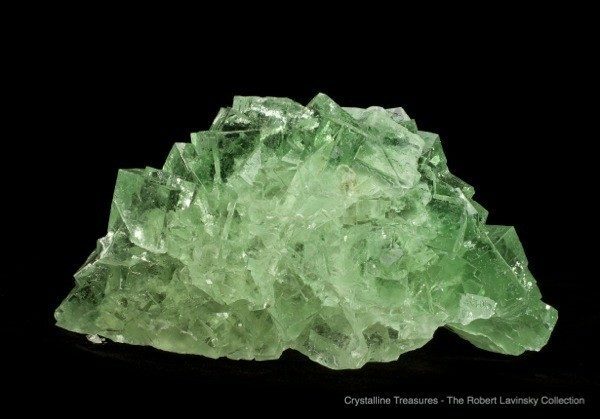 Some Westerners collect only crystals which are completely transparent, or (as we say) “gemmy.” Such crystals, for example emerald, tourmaline and topaz, are not only prized by crystal collectors for their specimen value but are also prized by gem cutters for their potential value as faceted gemstones. “Gem” crystals like these, especially when brightly colored, are held to be extremely valuable in both ways, their gem value boosting their specimen value (and price) by several times at least. Rare and unusual species, when they are colorful, well-crystallized and gemmy, make for the most highly prized of all mineral specimens in the West, even though their crystals are most commonly small; examples of species with this potential include scheelite, proustite and scorodite. A high degree of light reflectivity from crystal faces is a very valuable characteristic of any mineral; miners sometimes call this property “shine.” For non-metallic species a glass-like shininess is important; and for metallic species, which cannot be translucent or transparent, the degree of metal-like shininess, or metallic luster, is extremely important. A highly lustrous crystal of a metallic mineral such as acanthite or bournonite can be worth as much as a gem crystal of emerald or topaz. But—and this is important—the luster must be entirely natural and not enhanced by polishing, oiling or chemical treatment. In this and the next two sections we look at the overall aesthetic harmony, balance and “sculptural” shape of mineral specimens. This quality is hard to quantify or describe; it can only be apprehended as an aesthetic whole. 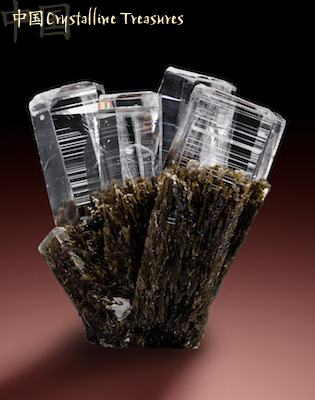 Some Western collectors like single crystals, that is, individual crystals which show no trace of the rock or mineral layers (called “matrix”) on which they originally grew. In German, matrix is called Muttergestein (“mother rock”): we sometimes use this term to describe the host rock to miners and people new to collecting, as Herb Obodda famously did in Pakistan in the 1970s. Among single crystals free of the “mother rock” the most highly prized are those which display the symmetrical, textbook-like, ideal shape of the mineral, without distortions or any broken points where the crystals had been attached to matrix. Such complete, loose, individual crystals are called “floaters” and can have a premium price. Species that do occur on matrix, such as tourmaline, must be spectacular to be considered desirable if lacking matrix. Others, such as tanzanite, rarely occur on matrix at all, and so singles are expected and in fact desired as the “standard” type of specimen for those species. Fluorite with quartz on matrix, 13 cm, from the Yaogangxian mine, Chenzhou Prefecture, Hunan Province, China. Found in 2009. 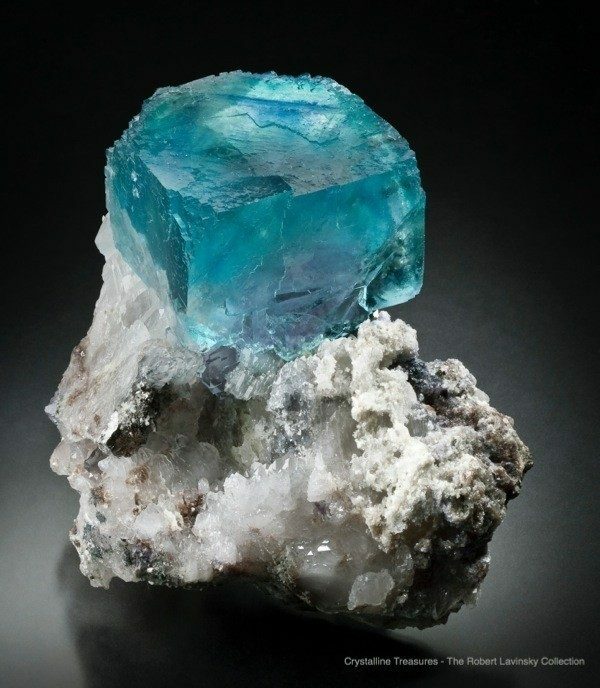 This is one of the finest known fluorite specimens from China because it has (1) unusually large crystal size, (2) crystallized matrix, (3) well-formed crystals, (4) an extraordinary focal-point crystal well-positioned on top of the matrix, (5) rare and beautiful turquoise-blue color with faint purplish blue zones, (6) attractive color contrast between the fluorite and the white quartz, (7) excellent crystal transparency, (8) excellent crystal luster, (9) aesthetic sculptural shape overall, and (10) freedom from damage. It is a world-class specimen with no shortcomings. Many mineral specimens are clusters of two or more crystals with no rock matrix attached. Among these, the most desirable are clusters with one or two sharp crystals which are much larger than the others and thus form “focal points” to which the eye naturally goes on first glance. We call this “dominant crystal aesthetics.” Crystal clusters showing these focal points are judged superior to clusters with many crystals which are all of about the same size, even when in large groups. The more prominent and well-centered the focal-point crystals are in the cluster, the more aesthetically fine the specimen is judged to be. When a specimen consists of a single crystal or a crystal cluster attached to matrix, we look for an aesthetic harmony between the size of the crystal or crystal cluster and the size of the matrix. Ideally the crystal or cluster should be at least half the size of the matrix; if the matrix area is too large in relation to the crystals on it, the specimen is less balanced. Also important, of course, is the harmony between the color of the crystals and the color of the matrix. A beautiful crystallized mineral with color, in balanced proportion on top of a contrasting crystallized host matrix with a different color, is judged to be the best possible matrix specimen. It is acceptable for matrix to be carefully trimmed down and even sculpted into an aesthetic size and shape, as long as the surfaces look like natural breaks (and not, for example, flat sawed surfaces). Experienced Western collectors typically do not tolerate any clearly visible damage to crystal specimens—especially on the smooth faces of crystals or on their terminations. “Damage” here means visible bruises, chips, broken areas or cleaved surfaces on the crystals, and it may also include unsightly broken areas on the matrix. A bruise or broken area on the prominent tip of a focal-point crystal, even if the damage is very small, may entirely destroy a specimen’s market value; that is, it may make a specimen nearly worthless even though every other part of the specimen is damage-free. Therefore we encourage miners and field collectors to use extreme care in recovering specimens, and in packing them and wrapping them carefully in soft material, so as not to damage the crystals. It is not acceptable for damage to be surreptitiously “fixed” or hidden by polishing or infilling with artificial substances unless that fact is disclosed honestly by the seller. Repairs and restorations are acceptable in some cases, depending on various factors such as the position of the repair or restoration, the significance of the specimen, and the skill of the preparator, but it must always be disclosed to potential buyers. Fluorite crystal cluster, 39 cm, from the Xianghualing mine, Chenzhou Prefecture, Hunan, China. Found in 2003. Although this one has not been treated, fluorite specimens such as this are very often coated with a thin layer of oil to “improve” the luster and facilitate sales. Many Chinese dealers consider this technique to be merely good business practice. 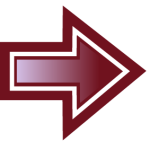 Although surface oiling is relatively harmless (since it may be washed off), the oil may also penetrate cracks and give a false impression of transparency. Oiling is therefore considered unethical by Western standards. We live now in a golden age of mineral collecting, with worldwide interest being continually fueled by new discoveries of crystallized minerals—especially in countries, like China, which have only recently become known internationally for producing a wide range of specimen-quality minerals. Each collector, of course, will evolve his or her own tastes and priorities in collecting fine mineral specimens. Still, there has been a longstanding cultural difference between East and West in judging which qualities of a “stone” are important to appreciate. While mineral collectors and museums in China and the West may have had somewhat different priorities, it is hoped that this attempt to describe how minerals are evaluated “in Western eyes” will contribute to broader cross-cultural understanding. Indeed it is hoped that this book will particularly inspire Chinese readers and miners to become even more fully informed members of the international community of those who value minerals for both art and educational purposes, and thus will encourage them to preserve and share these treasures from the ground. Thomas P. Moore, a mineral collector since childhood, began collecting in southeastern Pennsylvania. While in college he worked as a curatorial assistant, organizing, curating and augmenting the Irénée Dupont mineral collection at the University of Delaware (where he carried a double major in Geology and English). He received his Master of Fine Arts Degree in Creative Writing from Cornell University in 1975, and taught English for the University of Maryland in Germany for 15 years. Since 1986 he has written some 20 feature-length articles and more than 100 book reviews and reports on major mineral shows for the Mineralogical Record. Returning to the U.S. in 1991, he taught at various universities and colleges before being hired as staff editor for the Mineralogical Record in 2001. Because the mineral-dealing history in China is relatively recent and many dealers are often not well educated in either the collecting or the appreciation of fine minerals, difficulties may arise when the native Chinese collectors and dealers try to sell to the Western markets. One troublesome aspect is that Chinese dealers have commonly been willing to “enhance” the quality of the specimens in various ways which scrupulous Western collectors regard as highly unacceptable and unethical. For example, color-changing irradiation of specimens has become a common practice in China. For $5 per kilo, enterprising dealers can have minerals irradiated in medical facilities in Changsha. The technique is especially successful in changing pale colors in fluorite to intense greens or blues. Mediocre colorless or gray quartz from the Yaogangxian mine leaves the radiation chambers as “morion,” a very dark smoky quartz. The dealers customarily swear that these specimens are completely “natural,” and indeed they believe it to be the case using their definition of the term rather than the collector’s definition. Another problem is faked specimens, assembled from parts that did not originally grow together. Some years ago, glued-on cinnabar crystals flooded the markets, and many collectors and Western dealers worried about their effects on the market. The cinnabar of China had earned a good reputation early on, but suffered a disastrous decline in value because of this kind of faking.